Topic - "1sh -FISHING". Turks & Caicos Islands. SCOTT #165. Very Fine Condition & Centering. Mint Never Hinged - Original Gum. Issued 1967. Marine Life / FishIng. Hawker Siddeley Harrier British Royal Air Force. 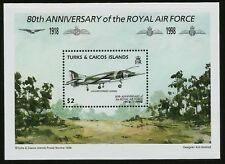 Turks & Caicos Island Mint Never Hinged Souvenir Sheet. Topic - "2c -BERMUDA SLOOP". Turks & Caicos Islands. SCOTT #280. Very Fine Condition & Centering. Mint Never Hinged - Original Gum. Issued 1973. Turks & Caicos Islands. SCOTT #282. Very Fine Condition & Centering. Mint Never Hinged - Original Gum. Issued 1973. Topic - "20c -HMS DARING". Turks & Caicos Islands. SCOTT #285. Very Fine Condition & Centering. Mint Never Hinged - Original Gum. Issued 1973. Turks & Caicos Islands. SCOTT #284. Very Fine Condition & Centering. Mint Never Hinged - Original Gum. Issued 1973. Turks & Caicos Islands. Topic - "1c -RED CROSS AMBULANCE, 1870". Red Cross / Horse / Ambulance / Horse / Wagon. SCOTT #209. Very Fine Condition & Centering. Mint Never Hinged - Original Gum. Issued 1970. Topic - "30c -BLUE MARLIN SWORDFISH". Turks & Caicos Islands. SCOTT #235. Very Fine Condition & Centering. Mint Never Hinged - Original Gum. Issued 1971. Looking for bargains to add to your collection?. Turks & Caicos Islands. Topic - "6p -SALT INDUSTRY". SCOTT #163. Industry / Raking Salt / Windmill. Very Fine Condition & Centering. Mint Never Hinged - Original Gum. Issued 1967. Topic - "15c -RED CROSS AMBULANCE, 1870". Turks & Caicos Islands. Red Cross / Horse / Ambulance / Horse / Wagon. SCOTT #211. Very Fine Condition & Centering. Mint Never Hinged - Original Gum. Issued 1970. Avro Vulcan British Royal Air Force. Turks & Caicos Islands. Charles Dickens (1812-1870), English Novelist. SCOTT #208. Very Fine Condition & Centering. Mint Never Hinged - Original Gum. Issued 1970. Novelists / Writer / Novels. Turks & Caicos Islands. Very Fine Condition & Centering. Mint Never Hinged - Original Gum. Issued 1967. SCOTT #160. Turks & Caicos Islands. Topic - "7c -CHRIST ON THE CROSS, BY ALBRECHT DURER". SCOTT #203. Very Fine Condition & Centering. Mint Never Hinged - Original Gum. Issued 1970. Turks & Caicos Islands. Topic - "5c -CHRIST BEARING THE CROSS, BY ALBRECHT DURER". SCOTT #202. Very Fine Condition & Centering. Mint Never Hinged - Original Gum. Issued 1970. Turks & Caicos Islands. SCOTT #234. Very Fine Condition & Centering. Mint Never Hinged - Original Gum. Issued 1971. Turks & Caicos Islands. Topic - "1c -SEAHORSE". Marine Life / Seahorse / Fish. SCOTT #232. Very Fine Condition & Centering. Mint Never Hinged - Original Gum. Issued 1971. Turks & Caicos Islands. Topic - "3p -SISAL INDUSTRY". SCOTT #161. Very Fine Condition & Centering. Mint Never Hinged - Original Gum. Issued 1967. Agriculture / Industry. Turks & Caicos Scott # 175-177 MNH. Turks & Caicos Islands. SCOTT #159. Topic - "1 1/2p -BOAT BUILDING". Very Fine Condition & Centering. Mint Never Hinged - Original Gum. Issued 1967. Topic - "5c -HMS BLANCHE". Turks & Caicos Islands. SCOTT #281. Very Fine Condition & Centering. Mint Never Hinged - Original Gum. Issued 1973. Topic - "10c -HMS ENDYMION". Turks & Caicos Islands. SCOTT #283. Very Fine Condition & Centering. Mint Never Hinged - Original Gum. Issued 1973. That's what we do and we think it's a good idea. Our goal: To keep the thousands of wonderful covers we have in circulation so that they find their collectors! We tried. We fill almost 850 orders a month and this is rising. Turks & Caicos Islands. Topic - "5c -RED CROSS AMBULANCE, 1970". Red Cross / Ambulance / Auto / Transportation. SCOTT #210. Very Fine Condition & Centering. Mint Never Hinged - Original Gum. Issued 1970. Topic - "3c -QUEEN CONCH". Marine Life / Conch / Fish. Turks & Caicos Islands. SCOTT #233. Very Fine Condition & Centering. Mint Never Hinged - Original Gum. Issued 1971. "SOUTH CAICOS REGATTA". TURKS & CAICOS ISLANDS (1981). #463-6 #467 S/S ON. Here is a Collectible Turks & Caicos Islands 1980 Stamp Pin Walt Disney Pinocchio 1/2Cent- P104. This stamp pin is in good condition with no issues. Turks & Caicos Islands. Topic - "3c -CHARLES DICKENS AND SCENE FROM "A CHRISTMAS CAROL". Charles Dickens (1812-1870), English Novelist. SCOTT #206. Very Fine Condition & Centering. Mint Never Hinged - Original Gum. Turks & Caicos Islands. SCOTT #204. Very Fine Condition & Centering. Mint Never Hinged - Original Gum. Issued 1970. Turks & Caicos Islands. Topic - "8p -SKIN DIVING". SCOTT #164. Very Fine Condition & Centering. Mint Never Hinged - Original Gum. Issued 1967. Topic - "15c -ADORATION OF THE VIRGIN AND CHILD, FROM WILTON DIPTYCH, FRENCH SCHOOL, c. 1395". Turks & Caicos Islands. Very Fine Condition & Centering. Mint Never Hinged - Original Gum. Issued 1971. SCOTT #279A. Turks & Caicos Islands. Color = Multicolor. A Very Beautiful Bird Stamp. Birds / Wildlife. MNH (Mint Never Hinged). Pencil # (Pencil writing on reverse of stamp, usually catalog number &/or price). Rem or Remnant (Paper or Hinge Remnant on reverse of stamp). Used – Cancelled. MNG (Mint No Gum - but not issued as such). Turks & Caicos Islands. 10c,Captain John Smith and Three-Master / 30c,Juan Ponce de Leon and Three- Master. Very Fine Condition & Centering. Mint Never Hinged - Original Gum. Issued 1972. Topic - "15c -CHARLES DICKENS AND SCENE FROM "PICKWICK PAPERS". Turks & Caicos Islands. Charles Dickens (1812-1870), English Novelist. SCOTT #207. Very Fine Condition & Centering. Mint Never Hinged - Original Gum. Turks & Caicos Islands #205 (A37) VF MNH - 1970 1c Dickens and "Oliver Twist"
Turks & Caicos Islands. Topic - "1c -CHARLES DICKENS AND SCENE FROM "OLIVER TWIST". Charles Dickens (1812-1870), English Novelist. SCOTT #205. Very Fine Condition & Centering. Mint Never Hinged - Original Gum. Turks & Caicos Islands. Topic - "25c -STAMP UNDER MAGNIFIER, PERFORATION GUAGE, LONDON 1980 EMBLEM". Lithograph / Perforation 14x14.5. SCOTT #431. London 1980 International Stamp Exhibition, May 6-14.